IT Recycling refers to Reuse and Refining of your IT devices, Computers, Laptops, Consoles, Tablets and Phones in the appropriate manner. Platinum Computers based at 42 Lister Street Hartlepool TS26 9LF Tel 01429 223522, offers you an IT recycling Service for all your computer devices. Got an old or fault computer, laptop or Tablet, you don't know what to do with it, worried about your personal data on there getting in to the wrong hands. Don't worry at Platinum Computers we can help, we can recycle your Computer for you and, destroy the hard drive where all your personal data is stored. You bring your computer, Laptop or Tablet in to us, We then give you 2 options. 1. 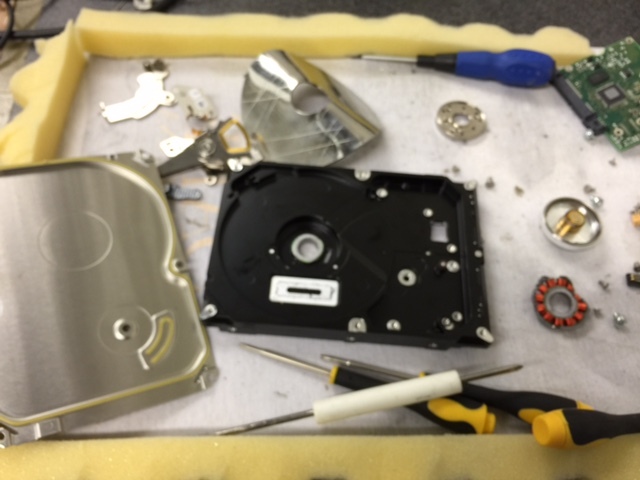 Remove the Hard Drive from your device and then erase the Hard Drive, this deletes the information, we would then damage the Hard drive as best as possible, but the information may still be retrievable, if someone really wanted to get it. This costs around �5. We try to be as enviromentally consious as possible, how your device is usually recycled by us is, We will remove the hard drive from your Computer or Laptop (if it is a tablet or a phone we will endevour to destroy memory module on the logic board) and proceed on the option above you have asked us to do, we will then remove the motherboard (main circuit board inside) and send that to a refining company, any hard plastics will go to the local ammenities site and any Iron will given to a local metal recycling company. To ensure your Personal data is erased to the degree you specify, and your IT devices are recycled to a high standard, we do charge a small fee for the services.